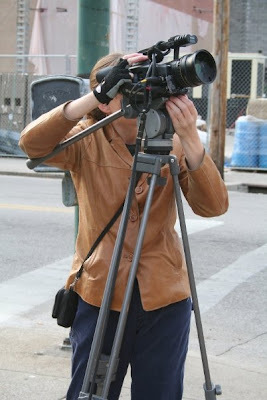 Viewfinder on CET will be highlighting two media projects currently in production in Cincinnati's historic Over-the-Rhine. Over-the-Rhine: The Series is described as a "gritty crime drama," and Rebirth of Over-the-Rhine is a documentary about the rebirth of the neighborhood and the people who live there. On tonight's show at 7:30pm Viewfinder will have Joe Brinker (co-producer), Melissa Godoy (director) and Mike Jones (subject) from Rebirth of Over-the-Rhine to discuss the documentary. The show will also have Lee Zellners (producer/director), Kole Black (co-writer) and Brent Bridges (co-writer) from Over-the-Rhine: The Series. In addition to tonight's 7:30pm show time, this episode of Viewfinder will be rebroadcast on Sunday, August 30 at 2pm. But is a crime drama good for OTR while it is trying to transcend that image? Probably not, especially given the way it looks like it's going to be interpreted. The documentary is what I'm excited to see.